This meze or appetizer is easy to make, and a favorite with wine or ouzo. It's prettier when made with large squid (calamari) but small work just as well (see photo). 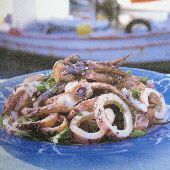 Place the whole squid, wine, and bay leaf in a small stew pot or dutch oven. Bring to a boil, lower heat and simmer, covered, for 35-40 minutes. Drain, and cut into rings. Place on a serving platter or in a shallow salad bowl. Sprinkle with salt, pepper, and oregano. Add olive oil and vinegar to taste. Top with parsley and onion slices.